Ever been told to bite the bullet? Now you really can. Ever been told to bite the bullet? Now you really can. 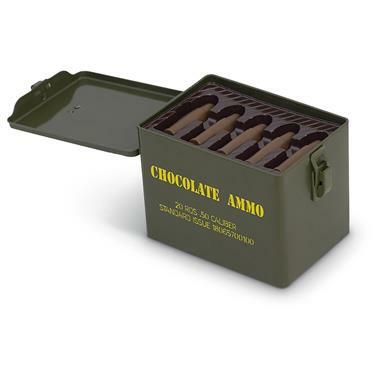 Take aim at your sweet tooth with these milk chocolate bullets. These .50-caliber bullets are made of solid milk chocolate and make a tasty and memorable gift for any occasion. And once the ammo is all gobbled up, the stackable, lockable container can be used for storage and makes a great conversation piece. Reusable can measures 5" x 3.5" x 4"h.
Dimensions: 5" x 3.5" x 4"h.